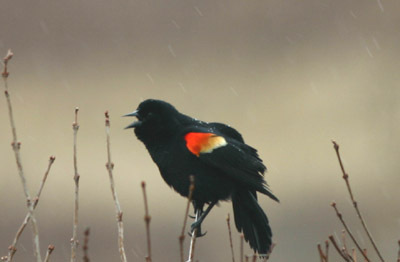 Folks unfamiliar with Detroit’s NHL team can be forgiven for thinking that the organization is named for the Red-winged Blackbird. After all, Agelaius phoeniceus is ubiquitous throughout most of North America, absolutely beautiful with males plumed in pitch black set off by epaulets of striking scarlet, and last but not least, belligerent, as anyone who’s been buzzed by a protective blackbird parent can attest. This is a bird that would do any hockey team proud, yet the Detroit Red Wings are not named for the Red-winged Blackbird. They aren’t named for a bird at all. The Detroit Red Wings are named for a wheel with wings. Inspiring, huh? It’s not as if Detroit didn’t have a chance to flaunt an avian as its totem. The team first played under the moniker of the Detroit Cougars in the fall of 1926. A few years later, the organization switched to the Detroit Falcons. But in 1932, the ailing franchise was purchased by shipping magnate, James Norris Sr., a former player for the Montreal Amateur Athletic Association’s Winged Wheelers. So enamored was the new owner with that experience that it was decreed the team’s new logo would be a winged wheel; hence, the Red Wings. The Red Wings are a potent team, with 10 Stanley Cups to their credit. Nonetheless, bird lovers may be inclined to root for a team with a real avian appellation, the Anaheim Ducks. But don’t get too excited… the once-Mighty Ducks are named not for any wild waterfowl, but presumably for the barnyard breed that inspired Donald Duck! That’s what happens when Disney buys a hockey team… you get the “Mighty Ducks of Anaheim.” It’s cool that their arena is called “The Pond” though. Being a lifelong hockey fan, I didn’t know the story of the Red Wings. Thanks! I think I’m going to root for the Ducks, now that my beloved Rangers have been ousted. No that’s not true. The name redwing came from Red wing Minnesota. Their red wing (which dates farther back than ours here in Detroit)Their red wing has no wheel and is proudly displayed on the work boots made there. The team acutely had to buy the redwings name from the town in Minnesota. Prior to that we were the cougars, ya know to match the names of the Tigers and the shity lions.